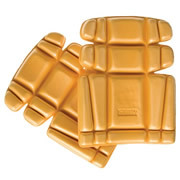 Ergonomic insert knee pads designed for an optimal fit and comfort. 100% impact absorbing polyeurathane, designed to fit into Dewalt work trousers. One size, ideal for general industrial use.